Saturday was quite an interesting day. We had our Ward Christmas Party (which was wonderful... as always) and then My Love and I decided it was a great time to get some Christmas shopping done. I think everyone else in the are had the same idea. While fighting crowds and traffic we were able to find some wonderful gifts for people. The whole shopping experience wasn't The Boss' favorite thing, though. Shortly after we had begun, he fell asleep. I tell you what, it may not sound hard, but toting around 25 lbs of curiosity is a bit hard... and when it is all dead weight, it is a lot harder. However, I didn't have to deal with it that time, My Love got to carry him around. After a while of arms that had fallen asleep from the weight we found a cart. Wow, my poor little guy didn't even fit in the cart. We arranged all the clothes so he could be comfortable, and then laid him in it. His little legs were sticking straight up in the air, but that was the only way he could sleep. His head and torso were longer than the actual basket. I wish I had my camera. It was the cutest thing ever! Yesterday I was looking through some recipes for Christmas Breakfast, and I had to laugh. I looked up and saw my son sitting in a box looking intently through a recipe book as well. It is true that they really do copy everything you do. He even let us take pictures of him which generally results in him stopping whatever he is doing and trying to grab the camera. Whew, what a darling little boy who always makes me laugh! On another note, I just have to mention the weather. My friend calls it a Marshmallow World, and how aptly named it is. Enjoy your first day of Winter today, my friends, and good luck with finishing your holiday preparations. Also, Happy Hanukkah! 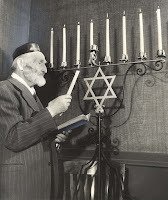 Today is the start of the Festival of Lights for all our Jewish friends. We went last minute Christmas shopping on Saturday at Fashion Place Mall and it was a madhouse! The line to see Santa was 2 hours long!